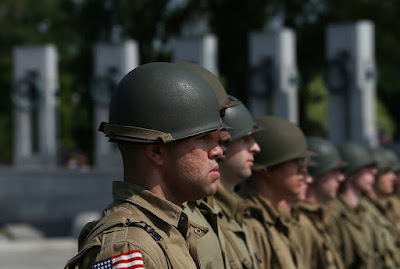 I was a draft resister, and I have never thought that our National Holiday, the Fourth of July, which happens to be my favorite holiday, should be identified with the many past and present military adventures upon which our nation has embarked. My personal feelings about this matter, however, are definitely not determinative. Public officials, like our President, tend to make references to the military on the Fourth of July. There is a lot of "military" type celebration on the Fourth. The triumph in World War II was a collective, democratic and unifying event, the likes of which we never experienced before (the Civil War in some respects rivaled the effect, but of course, it was also hugely divisive). It involved almost everyone. As soldiers, sailors and airmen, rich and the poor were tossed in together; so were North and South, urban and rural. Our Revolution, too, was a "collective, democratic, and unifying event." It did, admittedly, also involve a war, but we celebrate the Revolution not really to recall a military victory, but to honor our collective, national commitment to independence and democratic self-government. In what I thought was a compelling interview, Bill Moyers talked in 2012 to social psychologist Jonathan Haidt about our "contentious culture," the kind of culture that is making our politics dysfunctional. The focus in this interview was Haidt's then-new book, which became a best-seller: The Righteous Mind: Why Good People are Divided By Politics And Religion. Efforts to overcome our political divisions by engaging the nation in new military involvements are unlikely to be successful. Such military adventures do not seem to be bringing us together. More military involvements are not going to recapture the "unifying" effects of World War II. What about some other kinds of unifying projects? I think we need to find a few. I think we need to find them quickly, too. Well, that could even be revolutionary!